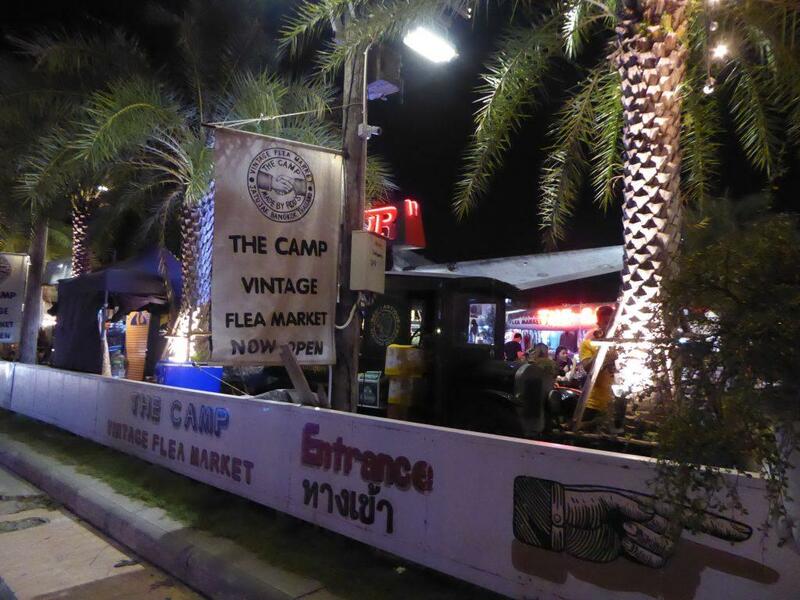 The Camp vintage flea market is in the Chatuchak area of Bangkok. It’s founded by the creators of the Train Night Market. The location is conveniently next to the MRT Kamphaeng Phet station and a couple of hundred meters from Chatuchak Weekend Market. 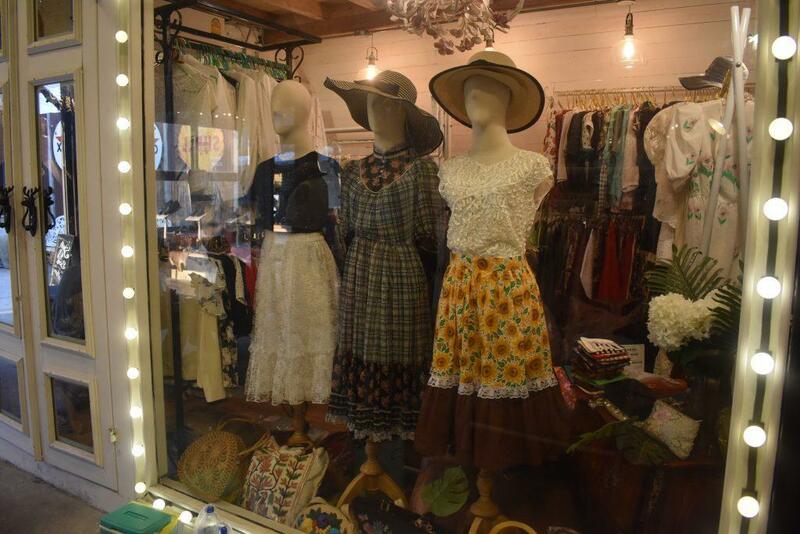 The Camp is heaven for vintage lovers. 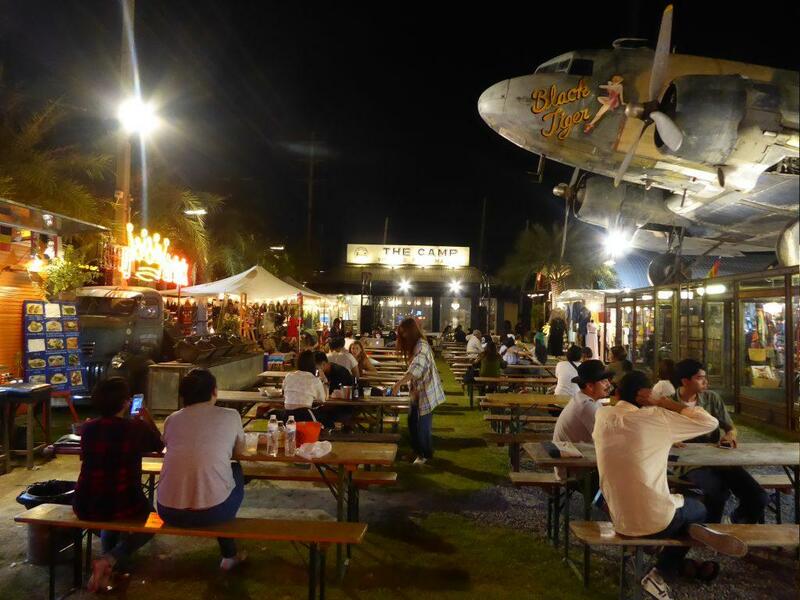 The shops are in aircraft hangar-style garages, an arcade, and an open market area. At the front of the market is a garden area with bench seating, food trucks, bars and a stage which features occasional live music. 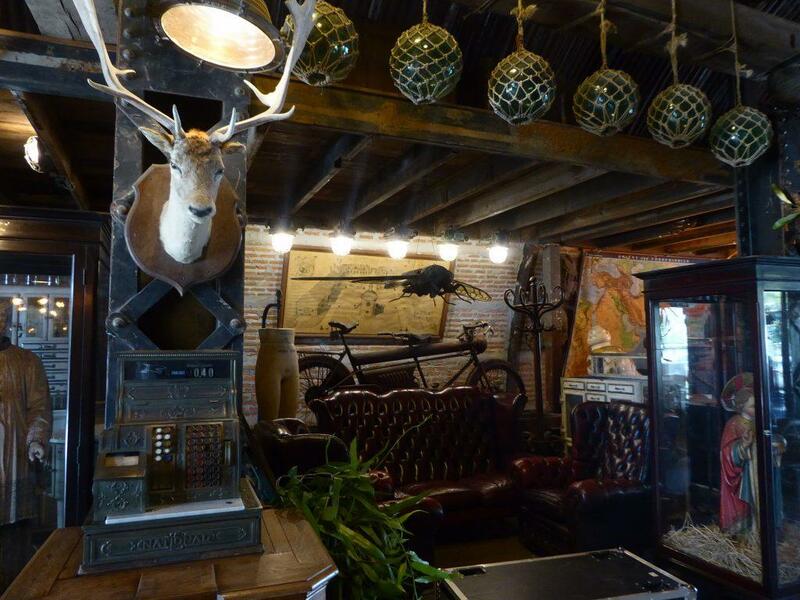 There’s also a great coffee-house full of vintage furniture & memorabilia. In the center is a food stall alley selling snacks. At the back of the market are a few more bars and restaurants. 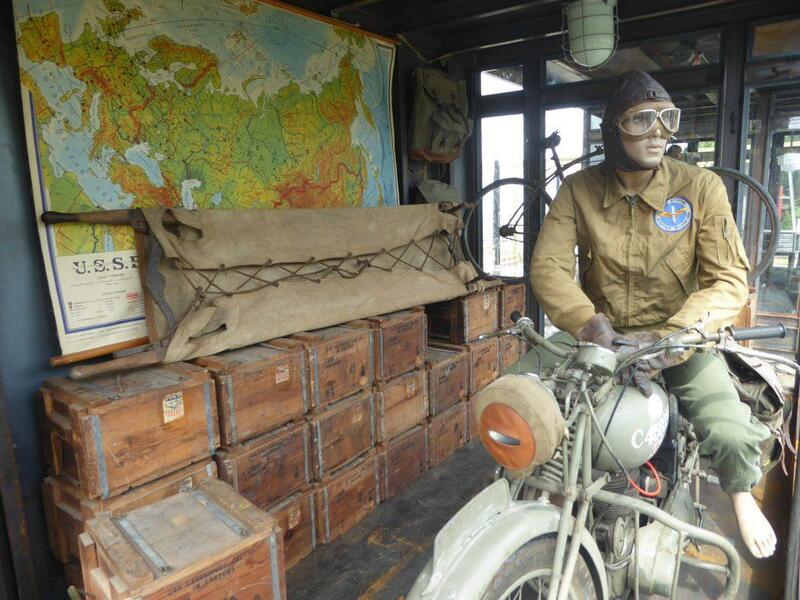 The Camps decor includes old trucks, motorcycles, scooters, campers, military vehicles, and even an old Dakota airplane. 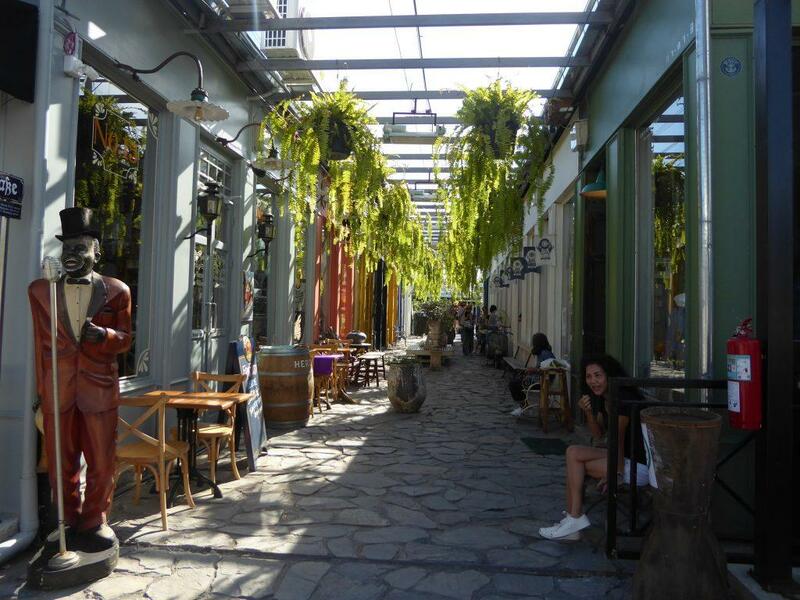 Entering the market from the MRT is a stone paved arcade style street with alternative & vintage clothes and vinyl record shops. 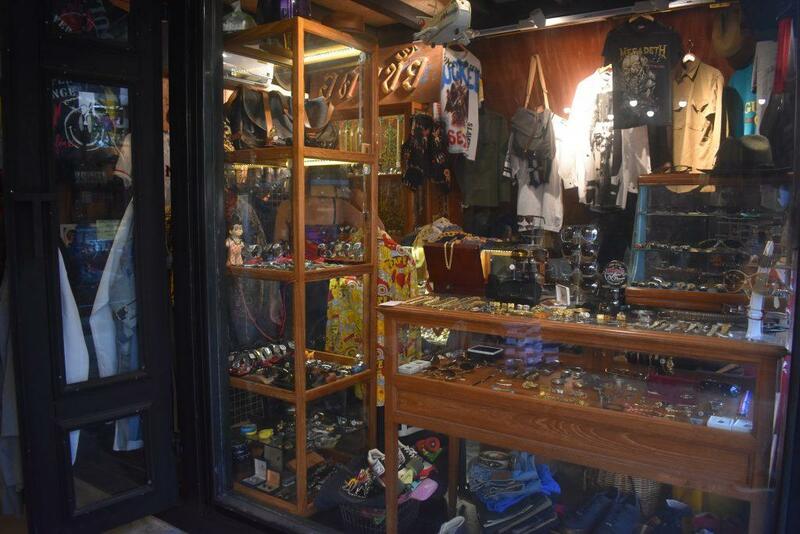 The shops here stock mainly men’s & women’s vintage clothing including shirts, trousers, 501’s, shorts, dresses, blouses, coats, jackets, shoes, hats, and accessories. There are also locally made designer products on sale. Also military uniforms and even old action man dolls in uniform. 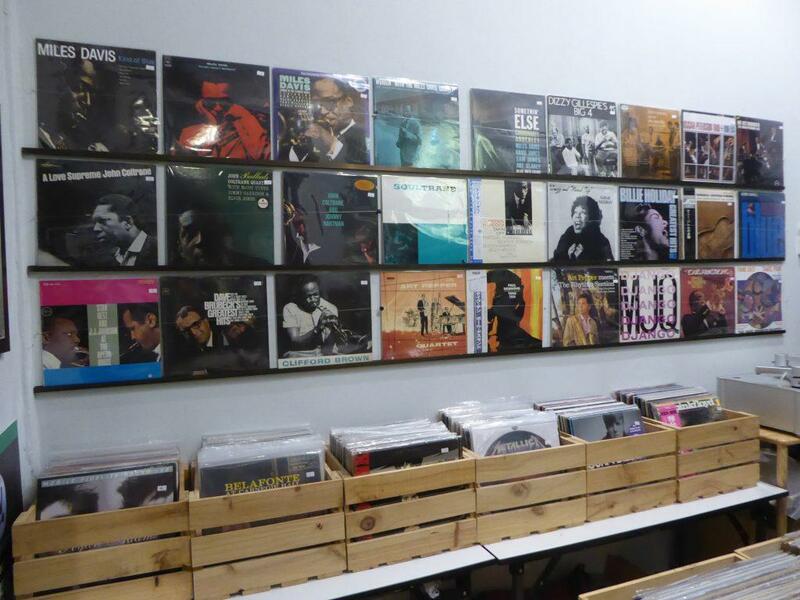 There are three vinyl record stores selling everything from Jazz, blues & soul to rock & pop as well as record players. 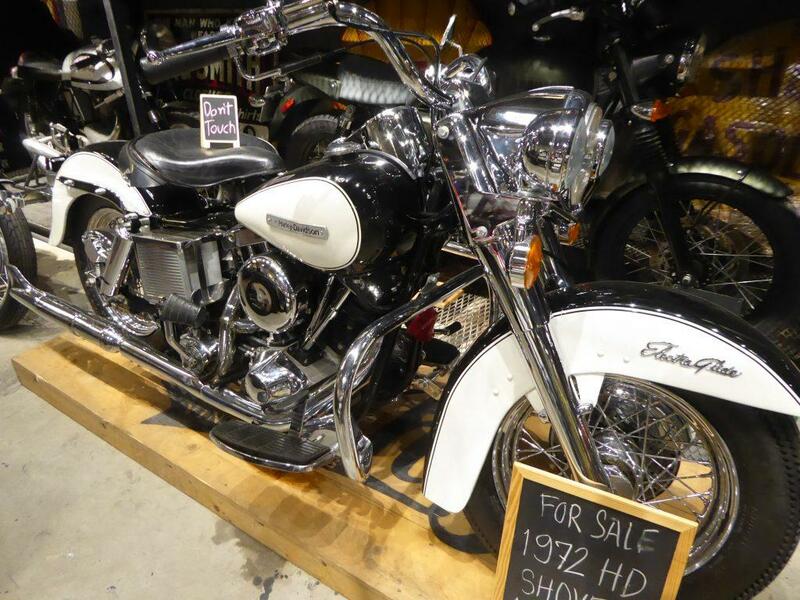 In the hangers, shops offer an exclusive collection of retro collectibles. 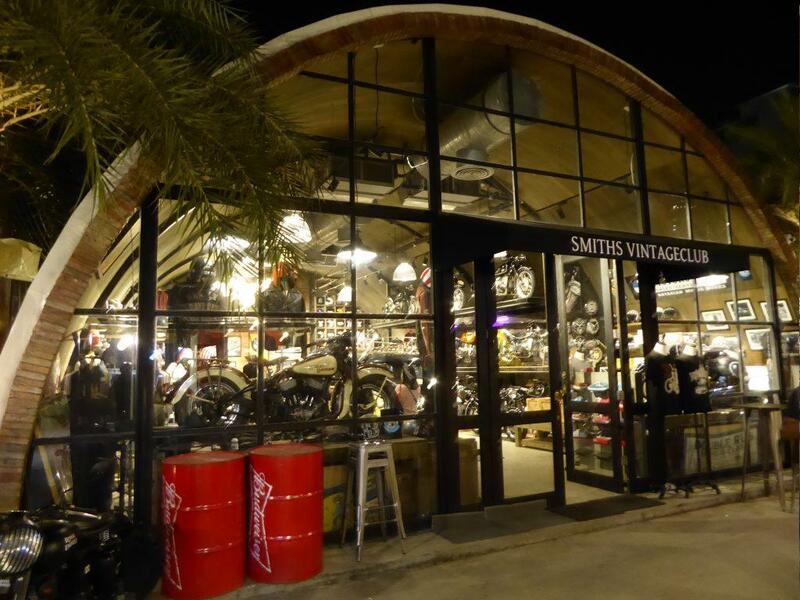 One of the highlights is Smiths Vintage Club which sells vintage classic motorcycles dating back to the 1950s and beyond. 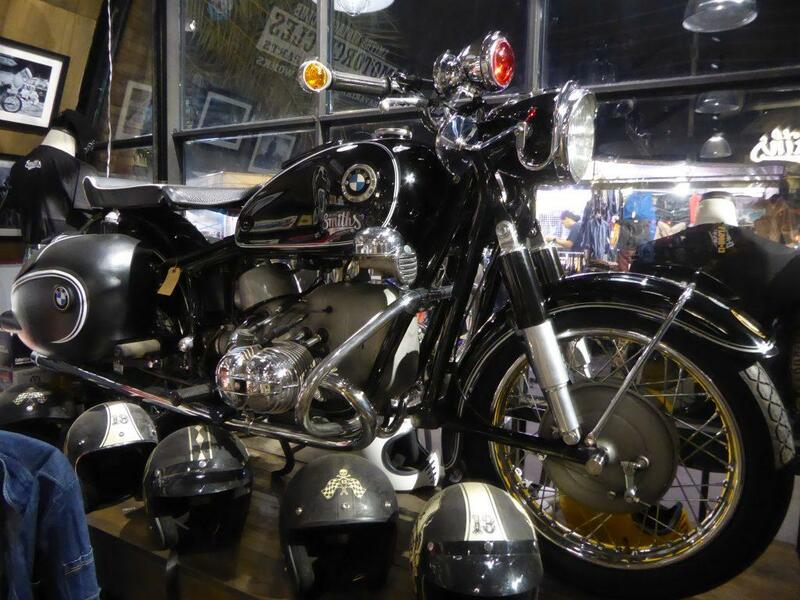 Harley Davidson, Smiths, Triumph, Ducati, BMW, Norton. 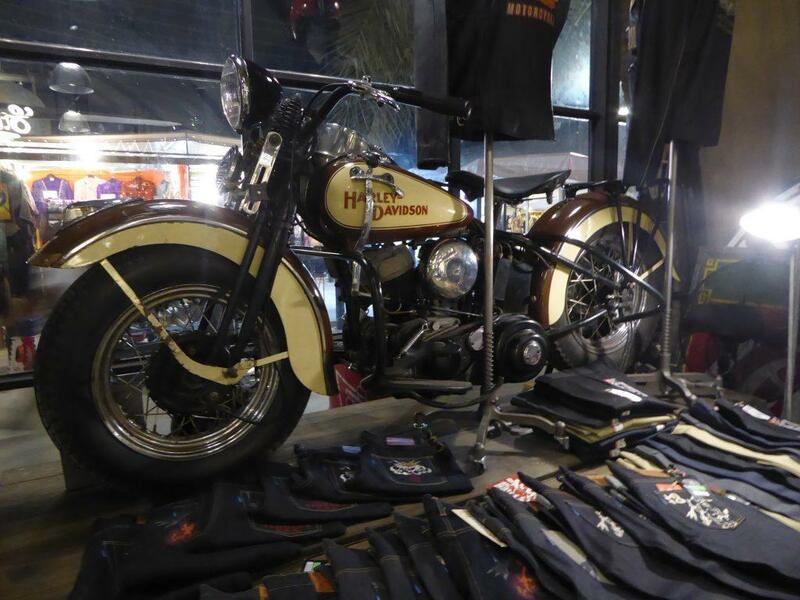 They also sell biker gear, t-shirts, helmets, gloves, vintage leather jackets, vintage jeans, vinyl records and more. 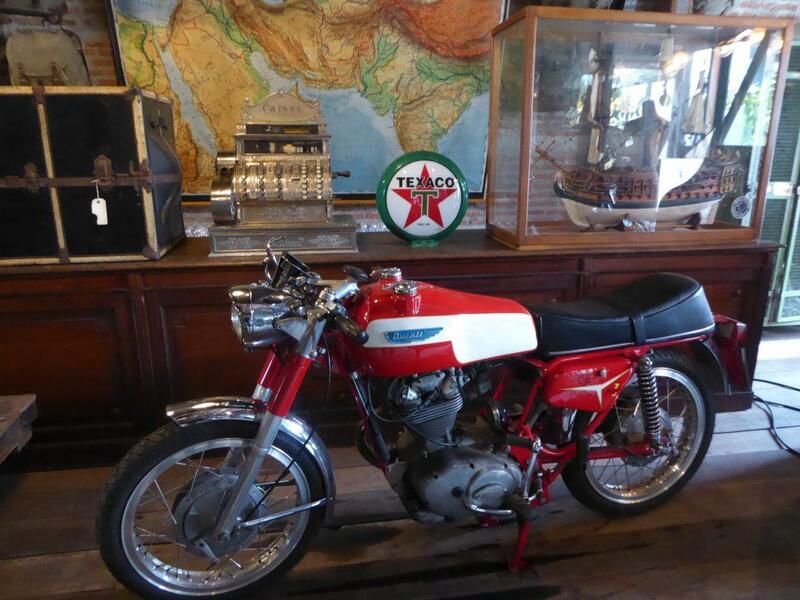 Pictures of motorcycle icons like James Dean & Steve Mcqueen adorn the walls. In the other hangers, you will find a host of antique and collectible items including old cash registers, maps, globes, model ships, signs, gas pumps, sculptures, stuffed animals, an ancient looking tandem bicycle, coca cola fridges, home decor items, furniture, giant searchlights, ammo boxes, mannequins, lamps, microphones and even an operating table and a dentist’s chair. 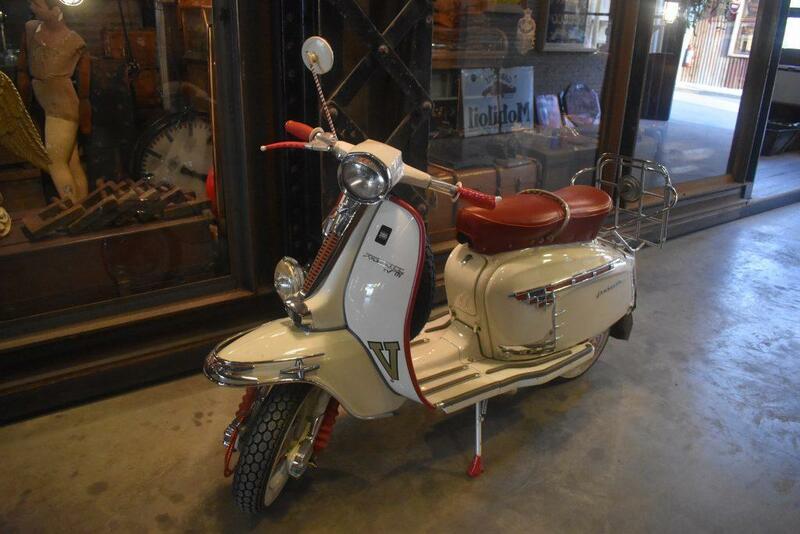 There are also vintage Lambretta & Vespa scooters and Ducati motorcycles. 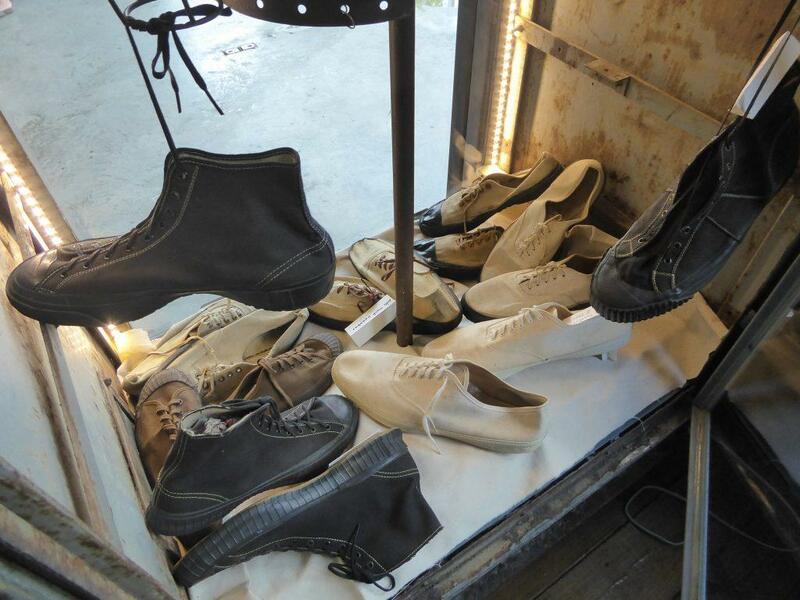 There are more clothes, bags, hat and shoe stores as well as a barber’s shop if you fancy a haircut. 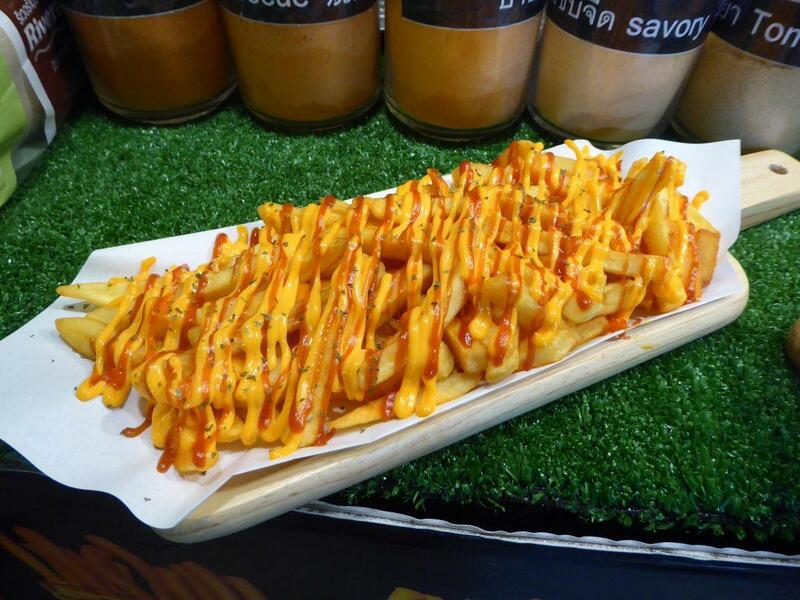 In the market area are stalls selling a variety of products and there is a food alley selling snacks and street style food. 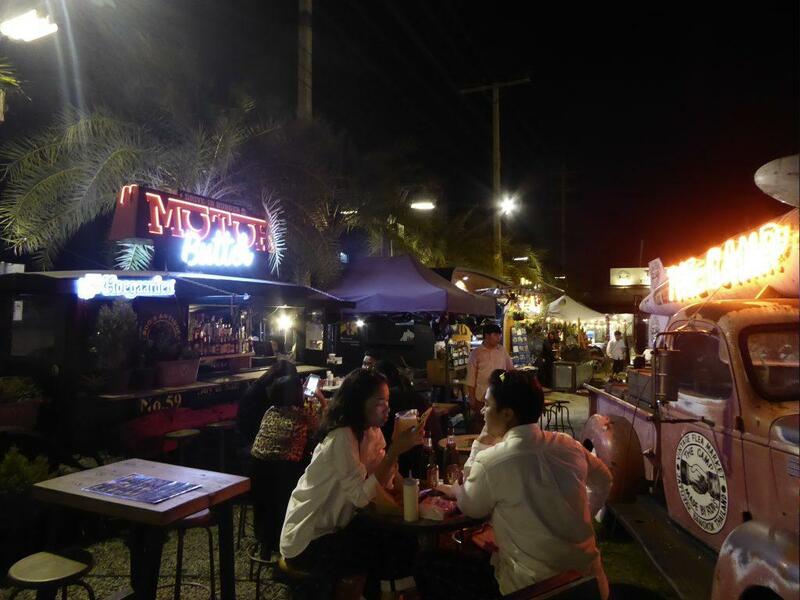 After checking out the market, The Camp is a good place to sit back, relax and enjoy a bite to eat with a beer or cocktail. 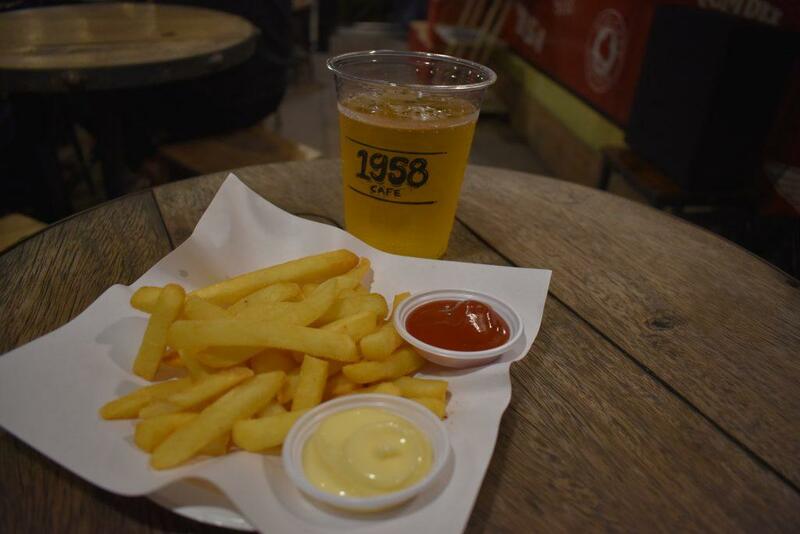 Prices are good with big bottles of local beer starting at 115 baht, or you knock back an imported beer like Leffe or Hoegaarden 100-270 baht or a local craft beer for 220-250 baht. 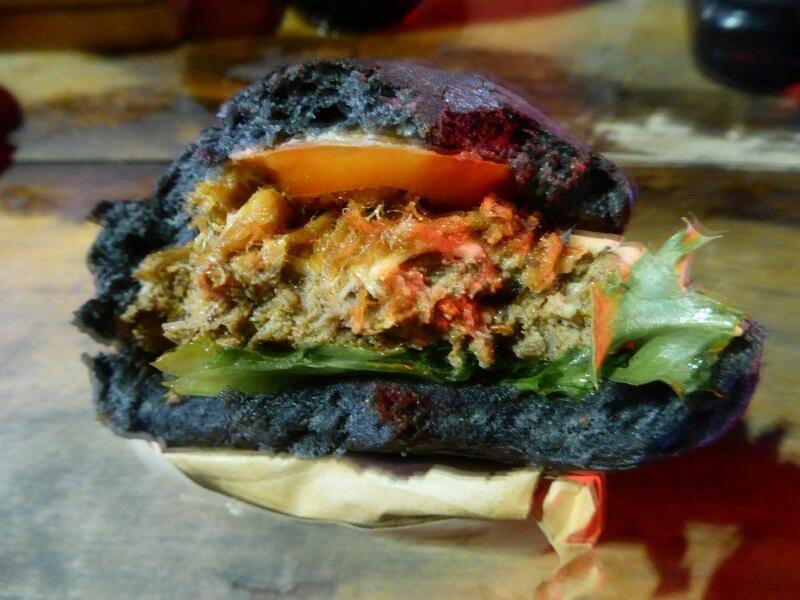 The food choices are excellent, Motor Butter Burger sells quality burgers (160-350 baht), try the Chiang Mai Spicy Burger! 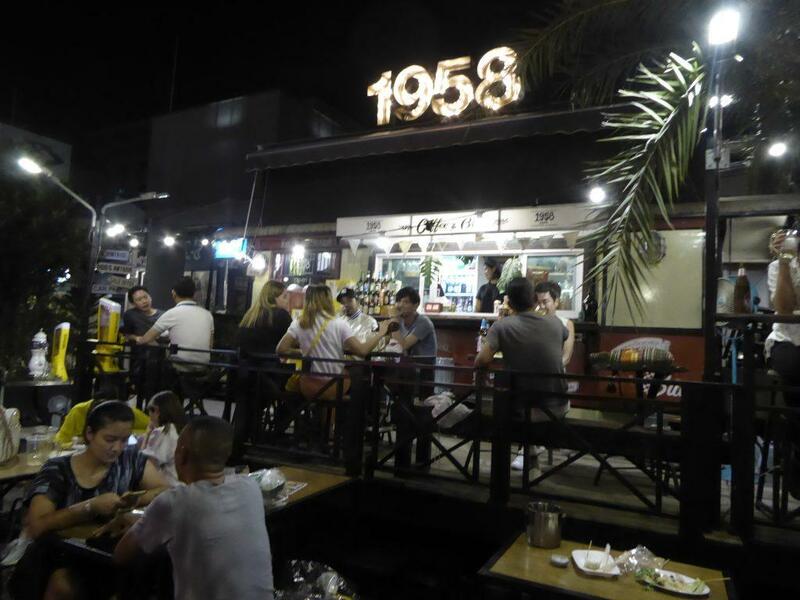 1958 Bar has a small menu of Thai dishes as well as wings & fries. Steak Jobs sells steaks and more from 100 baht. 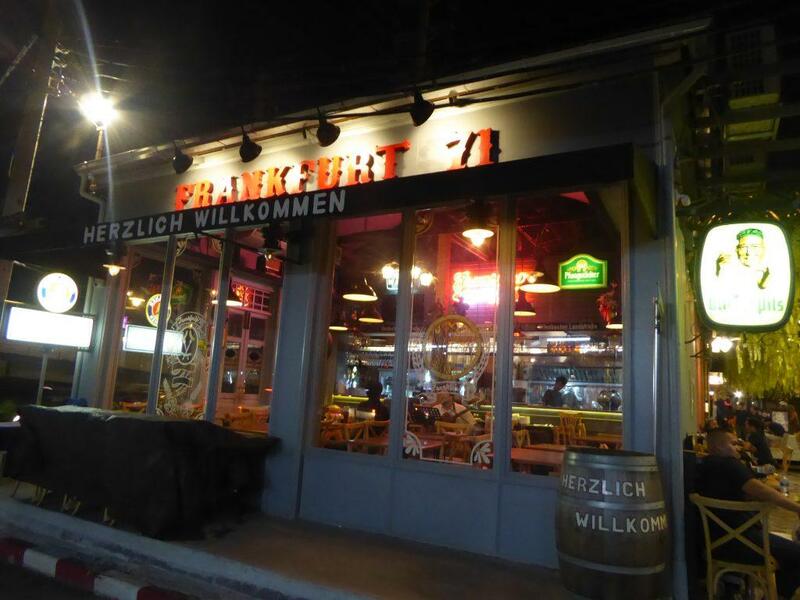 Frankfurt 71 in the arcade sells German & Thai food as well as imported German beers. 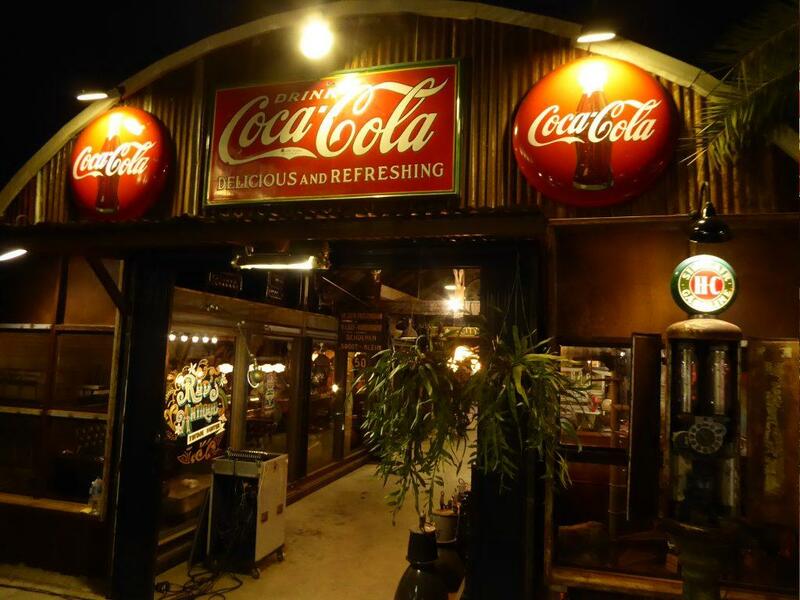 At the back of the market are several restaurants set in old railway carriages. The restaurants serve seafood, steaks, Thai & Asian food. 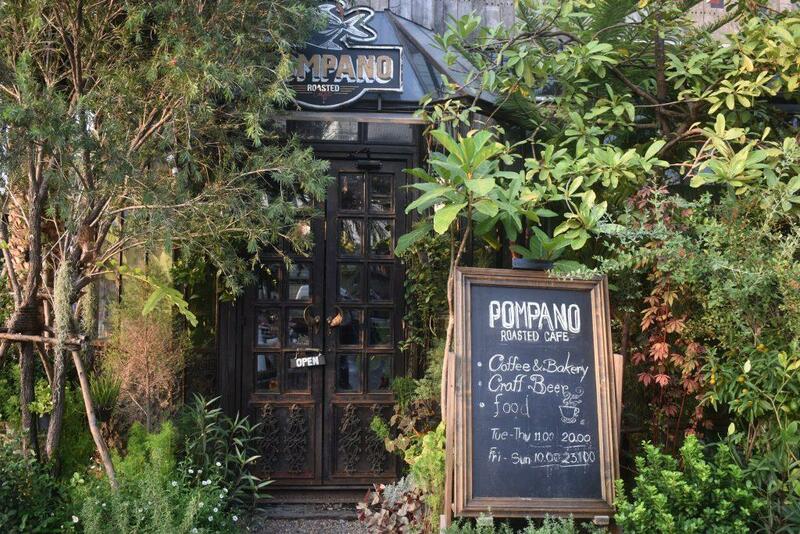 For Coffee lovers, there is the Pompano Roasted Cafe, set in a two-story wooden building surrounded by trees. 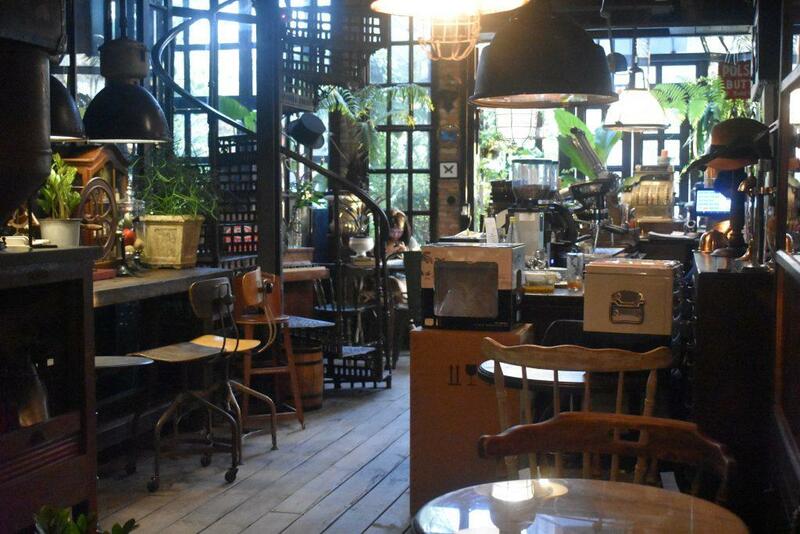 It’s one of the coolest cafes in Bangkok, full of antique furniture & knickknacks. 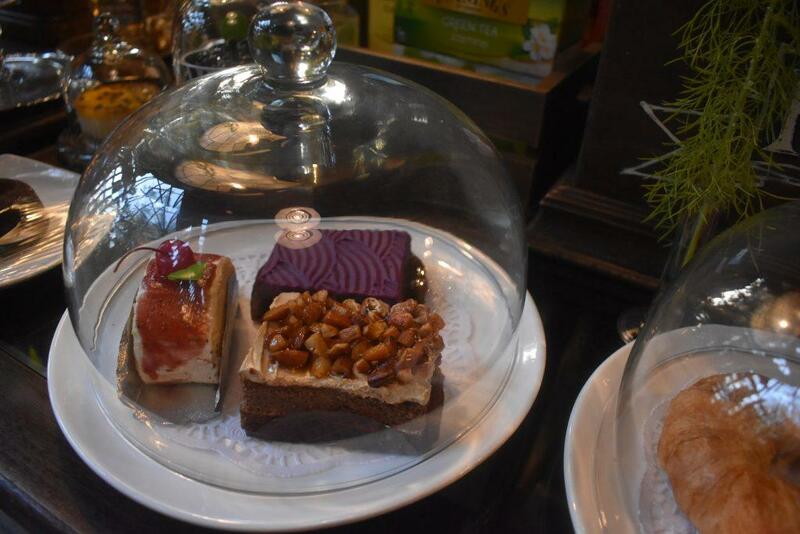 On the menu is hot & cold coffee and tea, sodas, smoothies, and juices along with cakes, and croissants. 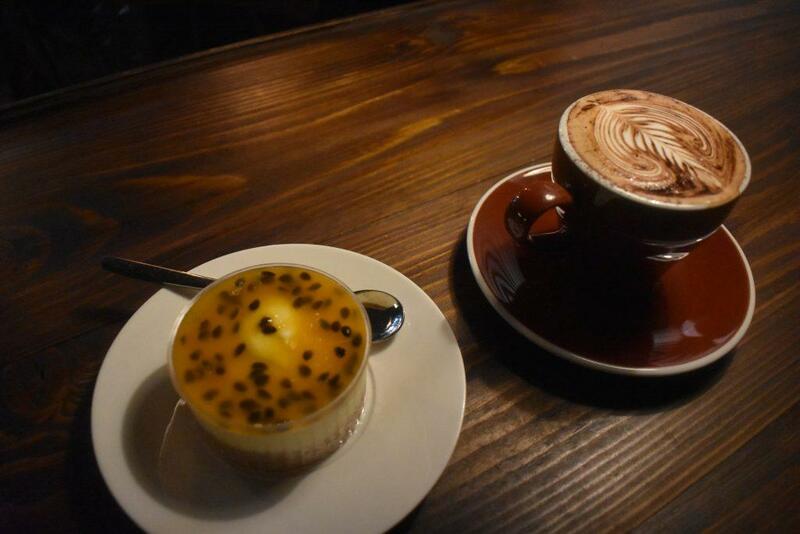 Coffee from 80 baht, Bakery 60-120 baht. They make a mean Cappuccino! The cafe also sells a good choice of craft beer. 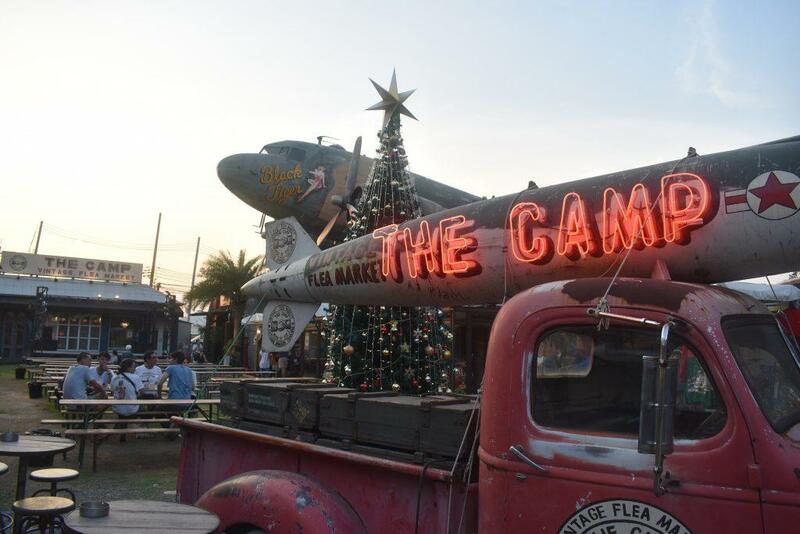 The Camp is a cool place to chill out in a relaxed setting with a good variety of food & drink. 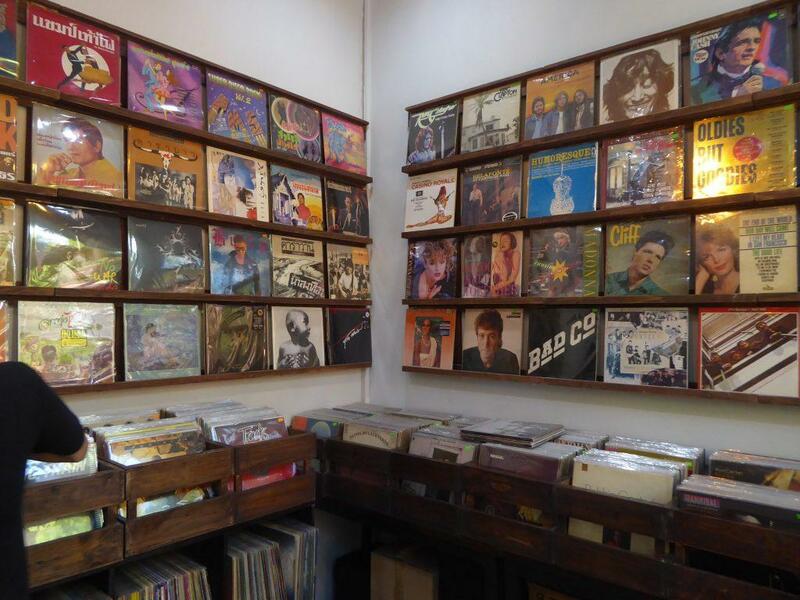 It’s a good place to head for on the weekend after Chatuchak Market winds down. 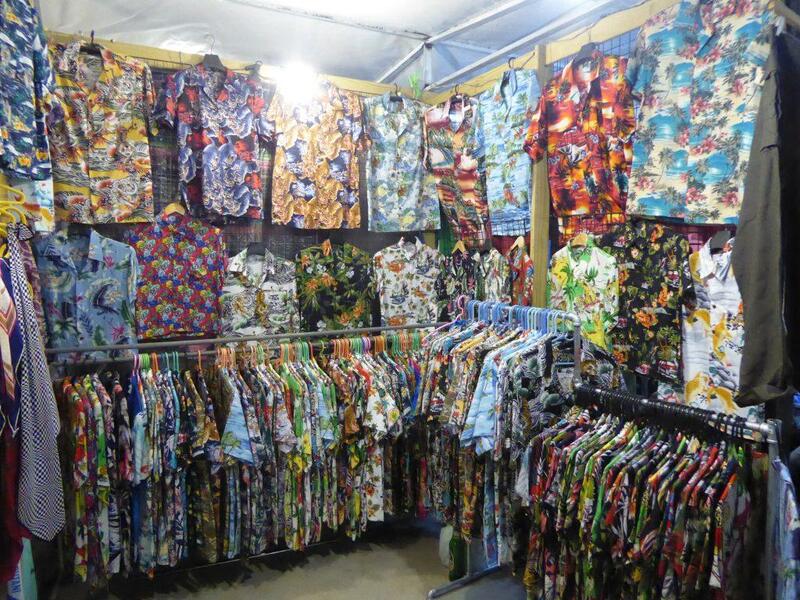 The best time to visit is Friday evening to Sunday evening when the market is busier and all the shops are open. 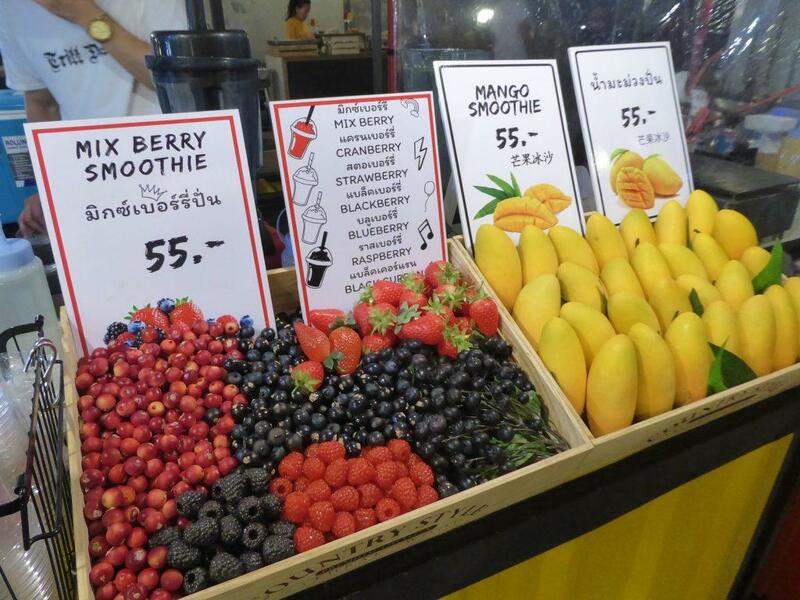 Location: 460 Kamphaeng Phet Road, Chatuchak, Bangkok. 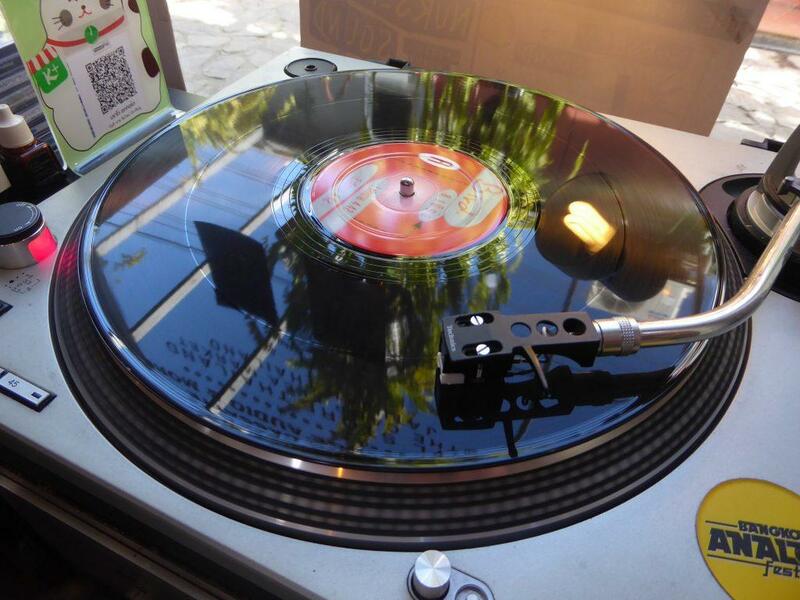 Opening Hours: 15.00-22.00 Tuesday – Thursday, 15.00-24.00 Friday, 11.00-24.00 Saturday-Sunday. Closed on Mondays. Getting There: MRT Kamphaeng Phet (exit 1). Turn right.